When I was a young, I looked forward to playing the piano. Practice was one of my favorite activities. It was a time to explore new pieces, to perfect old favorites and to enjoy the excitement and genius of great classical music. I assumed that this feeling was universal. After all what could be better than practicing? Over time, I learned that my enthusiasm is held by a select few. As a parent, I discovered that my love of practicing was not shared by my children. Many years ago, as a young teacher, I found that parents and students struggled to practice at home. Nothing is more important to me than passing along the joy of music making, but I found significant barriers with my own children and students who did not share my devotion to practicing. Musical skill is limited by lack of consistent concentrated experience with an instrument. To overcome the lack of enthusiasm for good practice, I curated the best ideas, tricks and tips to help students to practice. Take the time to listen to your child play. Your involvement shows how important learning the instrument is to you. Sitting with your child during their practice is especially critical for young children ages 3 to 8. As children get older, they can become more self sufficient and responsible, but you should still take the time to listen and enjoy their music making when possible. Partner with your child’s teacher to understand what the musical goals are for the week, not just the pieces that are assigned, but what the teacher hopes the student can accomplish. For example, know if they should be paying special attention to phrasing on their Minuet and a relaxed thumb on their scalar passages on their Sonatina. Ideally, attend the lessons with the teacher or record the lessons so you know what are the key goals for the week. You as a parent become the teacher at home! If something sounds good, applaud! Let your child know so they can experience the joy of music sharing. I remember that my parents would compliment me after I finished playing a piece and simply ask me to play it again because it was their favorite piece. This provided me with the motivation to play the piece again. Even if the piece doesn’t sound good, find something positive to comment on and ask the child to play it again. You are the cheerleader for successful practicing. Play recordings of great classical pieces, jazz and movie music. Take them to live concerts. Listen to recordings of pieces that they are playing. YouTube can be a terrific asset for listening to other students play your child’s repertoire. One of the things that I really like about the Suzuki Method is the recordings that are included with the books. Music is a language. We learn a language by listening to it and imitating it. Group classes are also an excellent opportunity to listen to other students play a common repertoire. Ideally, your teacher should create a written assignment at each lesson. The best format for this assignment is a practice chart. Each row should start with the assigned piece, theory worksheet or technical exercise. Specific notes should be made about the high level goals for each of these assignments. The columns should be numbered to reflect different days of the week. The student can then place an X in the grid to record what was done on each day. The student can also track the overall amount of time spent practicing each day. The old axiom is true: what gets measured, gets done. Tip #6 – Games, Bribes and Treats! Sometimes even with a plan, measurement and cheerleading, things break down. Your child refuses to practice and maybe even throws a tantrum! Don’t despair. There are others forms of motivation that can be tried. Music practice requires repetition and sometimes this can be tedious. One of my favorite way to overcome this frustration is to place three pennies on the left hand side of the music stand. Each time your child plays a passage correctly they get to move a penny to the right hand side of the stand. Each time they play the passage incorrectly they have to move a penny back to the left hand side. When all three pennies are on the right hand side they can keep them! If you are having a hard time motivating a child to sit down and practice, offer to exchange a chore for practice. Tell them that you will do the chore for them while they practice. The slower you do the chore; the longer they practice! You can also offer a positive reward such as an ice cream or special toy if they practice a set amount of time. Use these these bribes sparingly…but they do work! Life is crazy! But if it is possible to find a consistent time of day, it establishes a routine. Dr. Suzuki once quipped, “Practice only on the days you eat!” Practice should be routine as eating. Sometimes people find the mornings are best for practicing before all the craziness of the day sets in. Tip #8 – Be Patient. Be Kind. Remember that learning an instrument is challenging. There are going to be ups and downs. Be kind and patient with your child. If you have a bad day of practice with your child, remember that there is always tomorrow. Use these eight tips to help motivate your child to practice and learn the joy of music making! If you are in the Orlando area and would like to explore the possibility of studying at the Suzuki Music Institute, please sign up for an interview with us. Trick question – who is better qualified to teach your child music: a professional teacher or another music student? Surely, the professional teacher, right? Well, not exactly. Research done by Eric Mazur of Harvard shows that the fellow student can do a better job of teaching a student if the teaching professional facilitates the learning environment. Why? Because the student who has just recently mastered the material has a better understanding of the common misconceptions faced by a new student than the professional teacher who long ago mastered the material. Given this insight, it becomes clear why group class is such an important part of the music curriculum. To be clear, all teachers at the Suzuki Music Institute of Central Florida understand the importance of guiding and nurturing children’s development and play a crucial role in children learning to play their instruments. Private lessons provide the benefits of building technique, sequencing appropriate repertoire, delivering insights on articulation and phrasing, teaching students to read music quickly and accurately and many other benefits that only a master teacher can offer. Group lessons bring all the concepts learned through private instruction into a group environment that accelerates growth. One of the best things about group classes is that it motivates students. When a child sees one of their peers perform a piece, it builds confidence. After all, seeing is believing. If another student can perform a piece, the student believes that they can play it too. At our school, students, representing a diverse range of ages and experiences, perform a set of shared repertoire for each other every week. It has been our experience that students overcome performance anxiety and look forward to playing for each other. Regular performances help students to memorize their pieces, and for some of the more recalcitrant students, who are reluctant to memorize their pieces, memorized performances by other students set the standard. Positive performance examples provide the motivation for students to excel and meet the approval of peers. Students who didn’t want to memorize their pieces suddenly want to perform their memorized repertoire! When students hear their friends playing together, they are compelled to join in even if they don’t know a piece completely. As they play, or attempt to play, week after week, they hear the music all around them. Almost by osmosis, they start to learn the pitches and rhythms. In a sense, they fake it until they make it. Another added benefit of playing in a group is learning to perform pieces with a steady beat. Students that might rush or lag behind hear the steady beat provided by the teacher and student leaders and play along even if it means dropping a couple of notes. Students begin to innately feel the rhythm. Best of all, it’s fun to play in a group. Some of my best memories from my childhood include group performances in the community playing my Suzuki repertoire and favorite Christmas songs. There is a sense of community that is built through group performances and it gives young musicians the opportunity to socialize and make friends with other students. Trips to assisted living facilities with my fellow Suzuki students made, what would have been a lonely experience, a fun, heart-warming experience. We shared the gift of music with seniors that might not be able to get out and enjoy concerts in the community anymore. In return, we gained performance confidence which served us well for competitions and auditions. The motto of the story is that there is power in numbers. Music lessons can be a solitary experience. Students practice alone. Lessons are alone with a private instructor. However, music is a language. It is meant to be shared. It is through this sharing that learning is accelerated. Group classes provide the environment to share, to learn and to grow. These learning communities are absolutely essential to encourage the positive growth of music students. 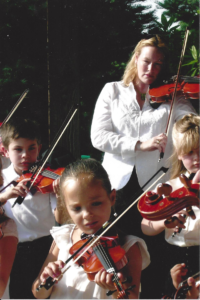 Are you considering music lessons for your child? There are so many extracurricular activities these days and so little extra time, it can be hard to choose the right activity. Here’s the top ten reasons that music lessons should be at the very top of your list as you consider after-school activities. Simply put, it is fun to play an instrument, and it is a gift that keeps giving. In my experience, the sense of accomplishment that students feel when they play for other people is unmatched by other extra curricular activities. Even as students grow up than can continue to play for their enjoyment. Einstein used the violin to relax when he became stuck in his thinking process. Music making clears the mind and calms the nerves! Children learn how to structure their time at home to prepare for their weekly lessons. The simple use of a practice chart teaches children to set aside time for practicing and to track their progress towards a long-term goal. It is a very kid-friendly way of learning how to plan ahead. And it pays big dividends, I know of business leaders that look for prospective employees that have studied music because of their respect of the self-discipline that is required to excel in music. You are probably saying, “What? Really, music lessons can increase my child’s IQ?” Yes, there is evidence to suggest that on the whole music lessons improve general intelligence. A study by E. Glenn Schellenberg of the University of Toronto published in Psychological Science shows that a group of students that took music lessons improved their IQ scores more than a control group that took no music classes. From a personal perspective, I’ve seen first hand how music can help students focus and develop their cognitive abilities. Going hand-in-hand with self-discipline, music lessons help to develop a strong work ethic. As students learn a difficult piece of music to perform for a concert, competition or evaluation, they must work hard to memorize and to develop the fine motor skills necessary to be successful. This type of conscientiousness is highly correlated with success in school and life. A short-term and long-term benefit, music has been shown to reduce stress by triggering biochemical stress reducers according to an article in U.S. Today. Music helps us to relax and forget about our troubles for awhile. The act of actually playing music accentuates these effects. The College Board reports that in 2012 students that participated in music scored an average of 31 points above average in reading, 23 points above average in math and 31 points above average in writing. In previous years, the results have been similar. While this might only be a correlative relationship, it is still compelling that music students outperform their peers. Music students also do better on other high-school standardized tests too. According to Dr. Laurel Trainor, Professor of Psychology, Neuroscience and Behavior at McMaster University, “Young children who take music lessons show different brain development and improved memory over the course of a year, compared to children who do not receive musical training.” This might account for the higher SAT scores! Research by Erika Skoe and Nina Kraus shows that music training in childhood positively changes to the anatomy and function of the brain and that these changes are carried into adulthood. Prior work linked music lessons to enhanced auditory brainstem encoding with heightened auditory perception, executive function, and auditory-based communication skills. Music lessons create better brains! Many high achievers have studied music. Nearly 100% of past winners of the prestigious Siemens Westinghouse Competition in Math, Science and Technology (for high school students) play one or more musical instruments according to the American Chemical Society. And if this isn’t impressive enough, many of our memorable leaders have played instruments or sang including Neil Armstrong, First man on the moon, Baritone, Thomas Jefferson, Former U.S. President, Violin & Cello & Piano, Woodrow Wilson, Former U.S. President, Violin, Harry Truman, Former U.S. President, Piano, Condoleezza Rice, U.S. National Security Advisor/Secretary of State, Piano, Alexander Graham Bell, Inventor of the telephone, Piano, Thomas Edison, Inventor, Piano, Albert Einstein, Nobel Prize Winner, Piano and Violin. In today’s tough world, it is important to build confidence in our children. Music is proven to do this. In fact, a study by Costa-Giomi published in the Psychology of Music investigated the effects of three years of piano instruction on children’s self-esteem. Children in the study were divided into two groups: piano instruction weekly for three years and no music instruction. Both groups had similar levels of self-esteem at the beginning of the study. The researcher found that the children who completed three years of piano instruction had a significant increase in self-esteem while the children who did not participate in piano instruction or dropped out of piano instruction did not have an increase in self-esteem. With so many great reasons to study music, you probably want to get started right away! If you are in the Orlando area, we would welcome you to the Suzuki Music Institute of Central Florida for a placement interview.